Do you ever wonder what kind of things I shop for on Amazon? Do you like discovering new products that I personally recommend? Looking for that spooky something to get yourself or that special someone? Are you interested in what cruelty-free and vegan products I use daily? Wanna check out my favorite vegan snacks? Have you ever wished to get your hands on the black nail polish I use or get a peek at what movies and books I'm into? Well, fiends, lucky for you I've curated a spooky shop on Amazon full of product recommendations so you can find all of these eerie items collected for you in one place! I thought this would be a fun way to show off some of my favorite things and show you what items I use regularly (for example, what hair dye or face wash I use, which I get asked about a lot!). Also, when you purchase items via my Amazon shop you are helping me earn referral fees, which go toward keeping this blog running, especially since I do not use ads, only Amazon affiliate links. So take a look at my spooky shop, filled with treats like Halloween decor, horror movies, books, accessories, cruelty-free and vegan beauty/makeup/skin care products, and even some of my favorite vegan snacks and food!! You just might find some must-haves or new favorites! I'll be updating the spooky shop regularly with new and old favorites, so check back often! 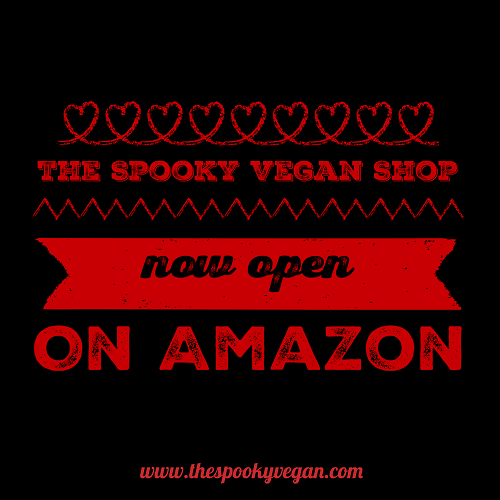 Visit The Spooky Vegan Shop on Amazon! Awesome idea!! Thanks for doing this!